Wales' education minister has published figures to explain how he can afford to protect Welsh students from higher tuition fees. Welsh universities' total income will not rise over six years in real terms, he claims. Under Leighton Andrews' projections, public funding for universities in Wales will fall. 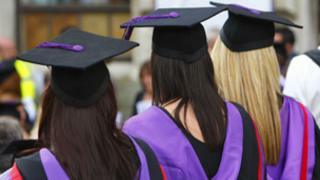 But income from higher fees, up to £7,000 a year for students from outside Wales, will rise. Mr Andrews said the figures proved the policy provided a "sustainable solution" for students and universities. Total income is set to rise from £1.18bn to £1.35bn by 2016-17. But the figures do not show income for individual institutions and there are fears some may be harder hit. Mr Andrews said he wanted to make public the financial calculations behind his high-profile pledge to protect all Welsh domiciled students from higher tuition fees. Under the projections, public funding for Welsh universities will fall from £395m next year to £301m by 2016-17. Income from student fees will rise from £224m next year to £411m by 2016-17. These assumptions are based on an average fee level of £7,000 from 2012, with inflation increases in following years. Mr Andrews said the figures, which take account of inflation, show his administration's tuition fees policy was "sustainable". The Welsh Conservatives, who say they will scrap the policy of lower fees for Welsh students if they win next May's assembly elections, have been calling on the education minister to publish the financial assumptions behind his policy. Under the minister's plans, Welsh domiciled students will pay no more than £3,290 whether they study in Wales or England, whatever the fees charged by their university. The difference will be met by the assembly government, using cash top-sliced from the universities' teaching grant. However, English students studying in Wales will have to pay the full fees charged by Welsh universities, which could be up to £9,000. This means that extra money will be brought into the Welsh higher education sector, despite the subsidy for Welsh student. At present, around 16,000 Welsh students study in England, with 25,000 English students choosing to study at Welsh universities. Mr Andrews said: "Our response to the increase in tuition fees in England, means that we are able to maintain a significant public subsidy of the higher education sector in Wales, whilst continuing to subsidise higher education for Welsh-domiciled students. "To pay for the increased fee support for Welsh-domiciled students, I announced that we would be top-slicing the HEFCW teaching grant by around 35% and that the income of Welsh HEIs will be the same in real terms in 2016-17 as it will be in 2012-13. "As the figures indicate, this is a sustainable solution that offers growth for our Welsh Higher Education Institutions while being fair to Welsh domiciled students."